Saucony pioneered the decently cushioned, low weight, much lower drop shoe with their Kinvara several years ago as a "safer" and quite frankly more practical alternative to super minimal for most runners. They extended the Kinvara concept to the more cushioned Cortana and Virrata. The last couple of years have seen some incremental changes but not much that excited me. I liked the Kinvara and had versions 1 and 3 but found the soft forefoot lugs somewhat unstable. I like a continuous ground contact forefoot platform. I immediately was drawn to the Iso Series on display comprised of updates to the Triumph, Hurricane, and a brand new model, the Zealot caught my eye. 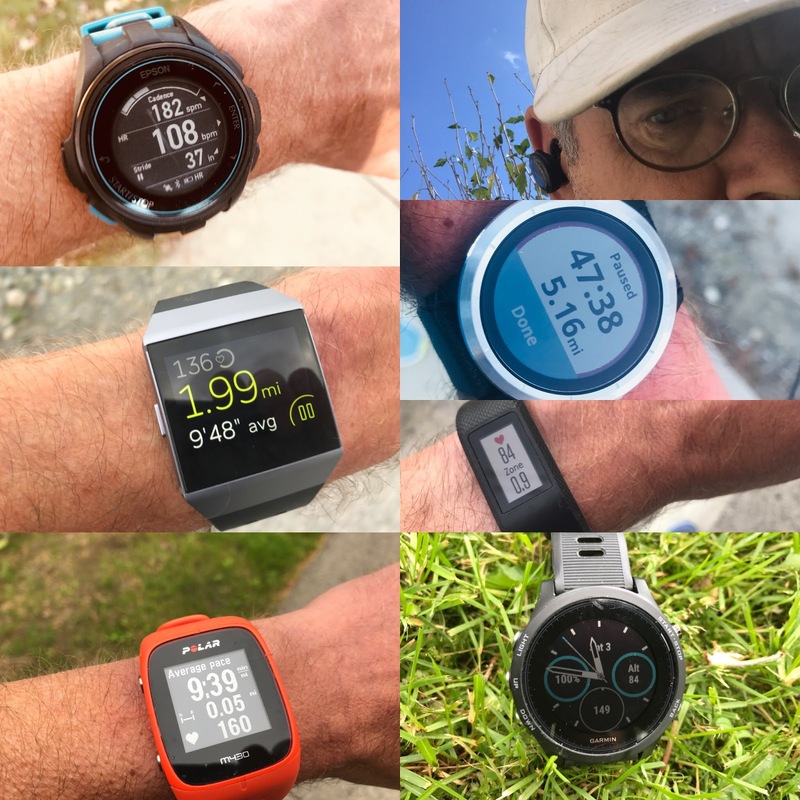 All Iso Series shoes have in common two things: a fantastic new upper and a 21mm forefoot, so by a kind of informal definition, maximalist cushioning. The Zealot is a 4mm drop shoe so 25mm at the heel, the others are 29mm. The Kinvara was 22mm heel/18mm forefoot so Zealot is clearly more cushioned. Weights: The Zealot comes in at 8.3 oz, Hurricane(stability) 11.1 oz., and Trimuph(neutral) 10.3 oz. The Zealot is a shoe in my sweet spot. I like a cushioned, full contact, responsive forefoot of about 20mm and the overall weight is low. Similar in many ways to the Hoka Huaka I am digging these days. The ISO-FIT upper is a combination of a truly sock like bootie with the laces and side supports partially free floating above the inner bootie. The idea is to accommodate different foot types and to not have upper overlays interfere with the foot. Running Warehouse blog describes ISO -FIT as follows: "ISO-FIT technology virtually eliminates the bunching or creasing in the upper that results from the change in shape of the runner’s foot and shoe during the gait cycle. This should drastically reduce pressure points that cause blisters and other irritation." 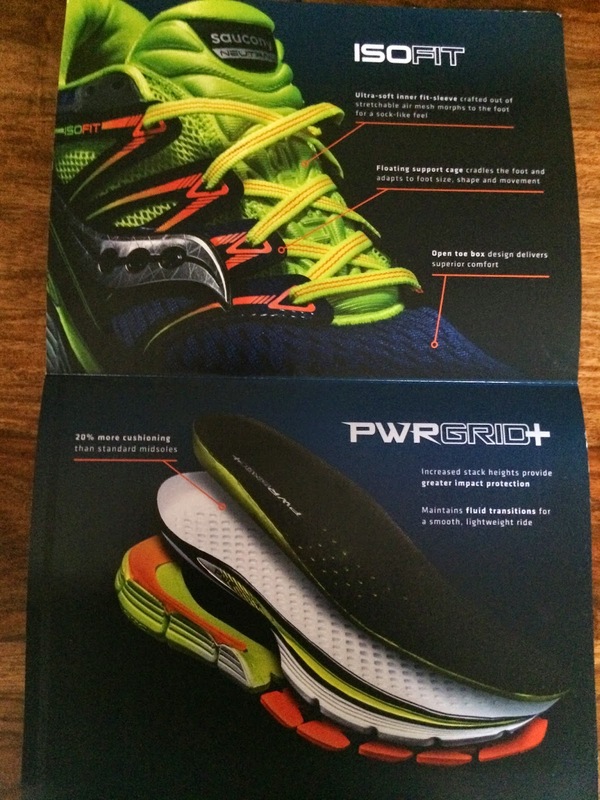 The midsole includes a layer of PWRGrid+. How would you describe the forefoot- is it roomy, or is it the usual Saucony width? Miki- Haven't tried Zealot on yet but soon will as I have a sample pair on the way. Will update when I try them on the run. Tried the Zealot yet? How did you like them? How do they compare to the Altra Paradigm (I run in these now) in forefoot fit and cushioning? Thanks! Sam, thanks for taking the time to comment. 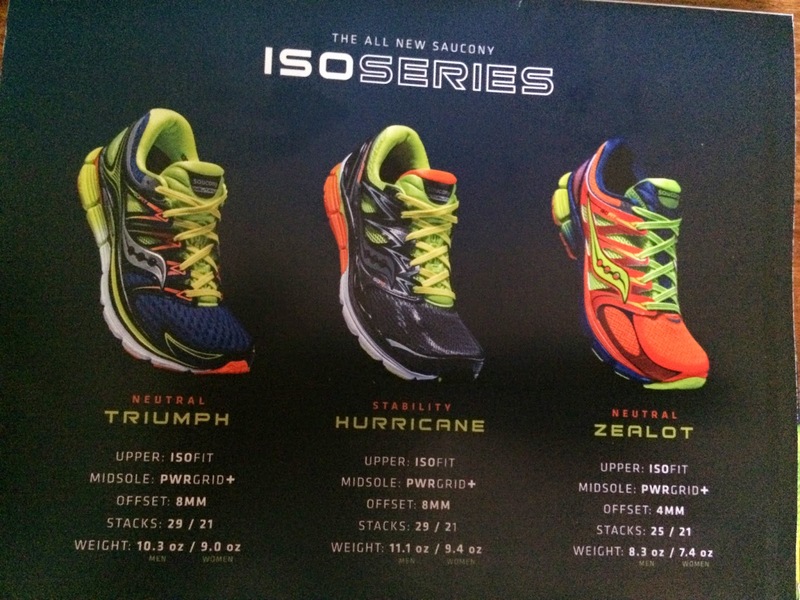 Looking forward to your review of the Zealot, I hope it has an acceptably wide/roomy forefoot. 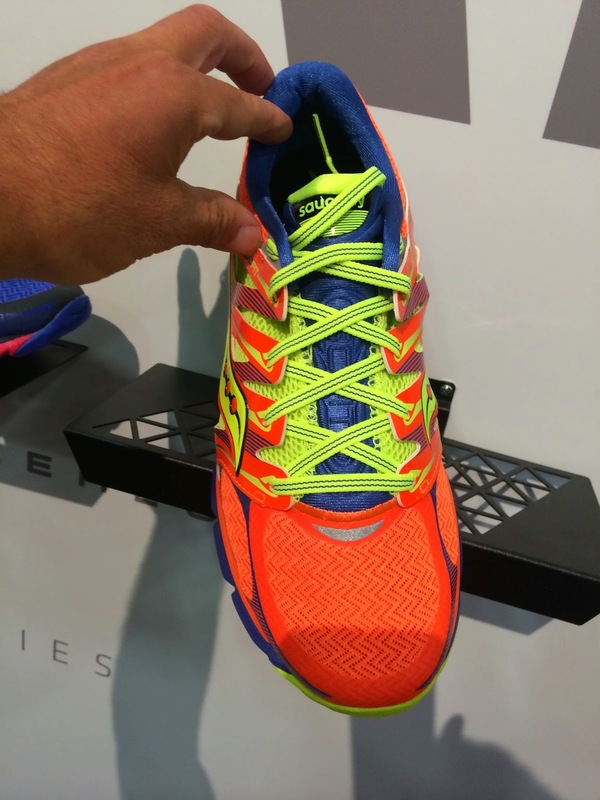 I'm a mid/forefoot runner so this shoe sounds great. I'm used to a little roominess in fit, been running in Altras for a while now. I think the Saucony Zealot and Altra Instinct 3 may be my next shoes. Thanks! Sam, the suspense is killing me! Need that Zealot review, LOL! I'm hoping the Zealot toebox is nice and roomy like the Altra road shoes (Paradigm, Instinct)? My Saucony Ride 7's (2E wide width) are ok, but I wish they were 4mm drop and had a bit wider or more flexible toe box, also wish they had a bit more forefoot cushion. If the Zealot is wide enough up front it will be great! Sorry Mike D. Got a marathon this weekend and then after that review. Got to say Zealot has me kind of puzzled Very firm heel due to thick very firm outsole material. Then they roll nicely is abruptly to a very cushioned softer forefoot. 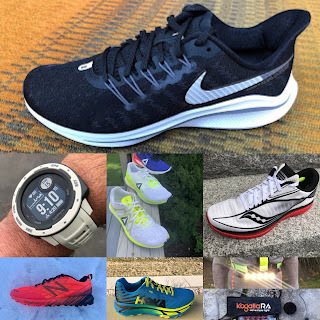 A shoe that for sure feels better run faster.The upper from midfoot forward... well the only to describe it is that it very soft and unstructured. Overlays even front bumper are soft too. So whole front of upper is far less structured feeling than Altra Paradigm. It feels wide but not as wide as Altra but due to the lack of structure maybe more volume vertically? but I might worry that with your super wide feet you would blow through the front somewhere. Thanks Sam, sounds like the Zealot will be worth trying. My feet are not THAT wide, I'm just a fan of the Altra foot shaped roomy toe box! If they dial in the midsole material for the Instinct 3.0, will be an awesome shoe. Look forward to your full review of the Zealot. Good luck in your marathon! What shoe did you wear for that? I picked up a pair of Hoka Huaka based in part on your review, I'm really enjoying running in them! Hey Mike D. If the Huaka is roomy enough for you then I am pretty sure Zealot will be OK too. I find the Huaka kind of a race snug fit especially around the last way forward lace hole. Mt Desert Island Marathon was incredible. Absolutely stunning scenery earns it "Most Scenic" and runner up "Best Overall" per Runners World. I concur. But brutal course with 1500 feet of climbing. Constant rollers with big big uphills miles 1-3 and... 21-25. I felt superb until...20 and then hip flexors gave out and I slowed to 10:20 pace coming in at 3:50.5. 8th in AG with 2 or 3 passing me in last 3 miles. Need to do core and hip exercises big time. Shoes I went with my trusty Energy Boost given hills. Zero issue, no quad soreness, no cramps (CEP calf sleeves are vital), no blisters. Best news my daughter ran her first in 4:02 with perfectly even first and second halves despite the tougher second half. She had more as she finished with an 8:06 last downhill mile but good that it was a positive experience for her. Please tell me the women's Zealot will come in a color other than pink! I'm a longtime wearer of Mirage 2 - switched to Cortana 4 after Mirage 3 didn't work for me. Zealot sounds perfect.